Redwood is a common name used for three species of trees with red or reddish colored wood, which are part of the subfamily Sequoioideae of the cypress family, Cupressaceae, of the conifer grouping. 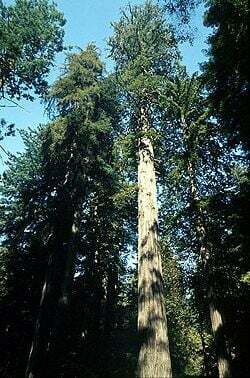 The three redwood species are the Coast Redwood (Sequoia sempervirens), the Giant Sequoia or Sierra Redwood (Sequoiadendron giganteum), and the Dawn Redwood (Metasequoia glyptostroboides). The term is also used for the wood of Scots Pine (Pinus sylvestris) and for two broadleaf tree species in the Fabaceae family, the East Indian Redwood (Caesalpinia sappan or Sapanwood tree) and the South American Redwood (Caesalpinia echinata or Brazilwood tree). However, the focus of this article is the three conifer species. Few trees have captured the human imagination the way that the giant redwoods have. As stated by Joseph Strauss, designer of the Golden Gate Bridge in San Francisco, California: "Here, sown by the Creator's hand, In serried ranks, the Redwoods stand; No other clime is honored so, No other lands their glory know. The greatest of Earth's living forms...:God stands before you in these trees." The Giant Sequoia also reflects the harmony of nature. Wildfires, often viewed simply as destructive forces of nature, are essential for the reproduction of the Giant Sequoia. Their suppression by humans hindered the life cycle of these trees. In addition, two animal agents, the longhorn beetle and the Douglas Squirrel, aid in seed release. The Coast Redwood (Sequoia sempervirens) is the world's tallest tree. Like the other redwoods, it has a massive trunk that only tapers slightly. The many, and much smaller, branches grow out horizontally. On young trees the branches start from ground level, but mature trees growing close together in a forest lose their lower branches up to a level of 20 or 30 meters (66 to 100 feet). This allows room for other plants, even other trees, to flourish in their shade. The trunk is covered with thick (up to 30 cm or 1 foot) reddish bark, which is soft and fibrous. The bark is highly resistant to fire, which protects the trees from all but the very worst forest fires. Unlike those of most other trees, the roots of the Coast Redwood do not go deep into the ground but spread out widely just under the surface. Dark green, needle-like leaves cover the branches. The seed cones are small (1.5 to 3 cm; 0.6 to 1.2 inches) and bear very small winged seeds in late fall when the rainy season is starting and the chances for the survival of the seedlings are best. Coast Redwoods are among the longest lived of all living things, reaching an age of 2,000 years or more. Coast Redwood trees over 60 meters (200 feet) are common, and many are over 90 meters (300 feet). The current tallest is the Stratosphere Giant in the Humboldt Redwoods State Park, at 112.83 meters (370 feet) as measured in 2004. It was 112.34 meters in August 2000 and 112.56 meters in 2002. The all-time tallest redwood whose height was verified was the "Dyerville Giant," also in Humboldt State Park. It was 113.4 meters (374 feet) high when it fell in March 1991, and was estimated to be 1,600 years old. There are 15 known living trees more than 110 meters (361 feet) tall. There are 47 trees that are more than 105 meters (344.5 feet) tall. A tree claimed to be 115.8 meters (380 feet) was cut down in 1912. The tallest non-redwood tree is a 100.3 m (329 foot) tall Douglas fir. The largest Coast Redwood in terms of volume is the "Del Norte Titan," with an estimated volume of 1044.7 m3 (36,565 cubic feet); it is 93.57 meters (308 feet) tall with a diameter of 7.22 meters (24 feet). Among current living trees only 15 Giant Sequoias are larger than this; these are shorter, but have thicker trunks, giving the largest Giant Sequoia, “General Sherman,” a volume of 1,487 m3 (52,510 cubic feet). In 2004, an article in Nature reported that the theoretical maximum potential height of Coast Redwoods (or any other tree) is limited to between 122-130 meters (400-425 feet), due to gravity and the friction between water and the vessels through which it flows. This is an example of a "fairy ring" sprouted from a stump. All the sprouts are identical clones with exactly the same genomic material. 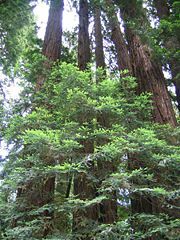 The Coast Redwood reproduces both sexually and asexually. Seed production begins at 10-15 years of age, and large seed crops occur frequently, but viability of the seed is low, typically below 20 percent. The low viability may be an adaptation to discourage seed predators, which do not want to waste time sorting chaff (empty seeds) from edible seeds. The winged seeds are small and light, weighing 3.3-5 mg (200-300 seeds per gram; 5600-8500 per ounce). The wings are not effective for wide dispersal, and seeds are dispersed by wind an average of only 60-120 meters (200-400 feet) from the parent tree. 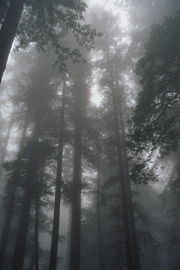 Fog is of major importance in Coast Redwood ecology. Redwood National Park. Growth of seedlings is very fast, with young trees known to reach 20 meters (65 feet) tall in 20 years. Coast Redwoods can also reproduce asexually by layering or sprouting from the root crown, stump, or even fallen branches; if a tree falls over, it will regenerate a row of new trees along the trunk. This is the reason for many trees naturally growing in a straight line. Sprouts originate from dormant or adventitious buds at or under the surface of the bark. The dormant sprouts are stimulated when the main adult stem gets damaged or starts to die. Many sprouts spontaneously erupt and develop round the circumference of the tree trunk. Within a short period after sprouting each sprout will develop its own root system, with the dominant sprouts forming a ring of trees around the parent root crown or stump. This ring of trees is called a "fairy ring." Sprouts can achieve heights of 2.3 meters (8 feet) in a single growing season. Redwoods may also reproduce using burls. A burl is a woody lignotuber that commonly appears on a redwood tree below the soil line, though when above, usually within 3 meters of the soil. Burls are capable of sprouting into new trees when detached from the parent tree, though exactly how this happens is yet to be learned. Shoot clones commonly sprout from burls and are often turned into decorative hedges when found in suburbia. The species is very tolerant of flooding and flood deposits, the roots rapidly growing into thick silt deposits after floods. Coast Redwoods occupy a narrow strip of land approximately 750 km (470 miles) in length and 8-75 km (5-47 miles) in width along the Pacific coast of the United States. The northern boundary of its range is marked by two groves on the Chetco River on the western fringe of the Klamath Mountains, 25 km (15 miles) north of the California-Oregon border. 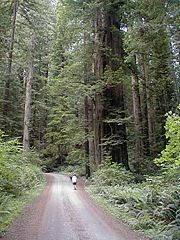 The largest populations are in Jedediah Smith Redwoods State Park (Del Norte County, California), Redwood National Park, and Humboldt Redwoods State Park (Humboldt County, California). The furthest inland are 75 km from the sea, in Napa County, California. The southern boundary of the range is marked by a grove in Salmon Creek Canyon in the Santa Lucia Mountains of southern Monterey County, California. Coast Redwood, Redwood National Park. This forest community includes Douglas fir, Western Hemlock, Tanoak, Madrone, and other trees along with a wide variety of ferns, Redwood sorrel, mosses and mushrooms. Redwood forests provide habitat for a variety of mammals, birds, reptiles, and amphibians; including the federally threatened Spotted Owl and the California-endangered Marbled Murrelet. Most of the remaining old growth Coast Redwood forests are now protected as State and National Parks, including Muir Woods and Redwood National Park. Millions of visitors from all over the world come to California to admire the beauty and grandeur of these ancient giants. Coast Redwood is one of California's most valuable timber species, with about 1 million acres of redwood forest managed for timber production. Coast Redwood lumber is highly valued for its beauty, light weight, and resistance to decay. It is also resistant to fire since it does not burn well due to its lack of resin. In the recent great fire of San Francisco, that began April 18th, 1906, we succeeded in finally stopping it in nearly all directions where the unburned buildings were almost entirely of frame construction and if the exterior finish of these buildings had not been of redwood lumber, I am satisfied that the area of the burned district would have been greatly extended. The Coast Redwood is locally naturalized (foreign or cultivated plant spreading into the wild) in New Zealand, notably at Rotorua. Other areas of successful cultivation outside of the native range include western Europe from the British Isles south to Portugal, the Queen Charlotte Islands, middle elevations of Hawaii, and the southeastern United States from eastern Texas to North Carolina. The Giant Sequoia (Sequoiadenron giganteum) is the world's largest tree in terms of total volume. They grow to an average height of 50-85 meters (150-280 feet) and 5-7 meters (16-23 ft) in diameter. Record trees have been reported to be 93.6 meters (307 ft) in height and 8.85 meters (29 ft) in diameter. The oldest known Giant Sequoia based on ring count is 3,200 years old. 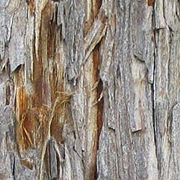 Sequoia bark is fibrous, furrowed, and may be 60 cm (2 ft) thick at the base of the trunk. It provides significant fire protection for the trees. The leaves are evergreen, awl-shaped, 3-6 mm long, and arranged spirally on the shoots. The seed cones are 4-7 cm long and mature in 18-20 months, though they typically remain green and closed for up to 20 years; each cone has 30-50 spirally arranged scales, with several seeds on each scale giving an average of 230 seeds per cone. The seed is dark brown, 4-5 mm long and 1 mm broad, with a 1-millimeter wide yellow-brown wing along each side. Some seed is shed when the cone scales shrink during hot weather in late summer, but most seeds are liberated when the cone dries out from fire heat and/or insect damage (see Ecology, below). The Giant Sequoia regenerates primarily by seed, although occasionally it may reproduce naturally by vegetative methods; trees up to about 20 years old may produce stump sprouts subsequent to injury. 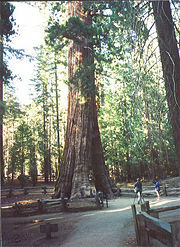 Giant Sequoia of all ages may sprout from the bole when old branches are lost to fire or breakage, but (unlike Coast Redwood) mature trees do not sprout from cut stumps. Young trees start to bear cones at the age of 20 years. At any given time, a large tree may be expected to have approximately 11,000 cones. The upper part of the crown of any mature Giant Sequoia invariably produces a greater abundance of cones than its lower portions. A mature Giant Sequoia has been estimated to disperse from 300,000-400,000 seeds per year. The winged seeds may be carried up to 180m (600 ft) from the parent tree. Lower branches die fairly readily from shading, but trees less than 100 years old retain most of their dead branches. Trunks of mature trees in groves are generally free of branches to a height of 20-50 meters, but solitary trees will retain low branches. The Giant Sequoia is usually found in a humid climate characterized by dry summers and snowy winters. Most Giant Sequoia groves are on granitic-based residual and alluvial soils. The elevation of Giant Sequoia groves generally ranges from 1,400-2,000 meters (4,600-6,600 ft) in the north, and 1,700-2,150 meters (5,600-7,000 ft) to the south. They generally appear on the southern side of northern mountains, and on the northern side of more southern slopes. 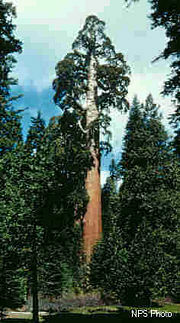 The natural distribution of Giant Sequoia is restricted to along a limited area of the western Sierra Nevada, California. It occurs in scattered groves, with a total of 65-76 groves, comprising a total area of only 14,416 ha (144.16 km² / 35,607 acres). Nowhere does it grow in pure stands, although in a few small areas stands do approach a pure condition. The northern two-thirds of its range, from the American River in Placer County, California southward to the Kings River, has only eight disjunct groves. The remaining southern groves are concentrated between the Kings River and the Deer Creek Grove in southern Tulare County, California. Groves range in size from 1,240 hectares (3,100 acres) with 20,000 mature trees, to small groves with only six living trees. Many are protected in Sequoia and Kings Canyon National Parks and Giant Sequoia National Monument. High levels of reproduction are not necessary to maintain the present population levels. Few groves, however, have sufficient young trees to maintain the present density of mature Giant Sequoias for the future. The majority of Giant Sequoias are currently undergoing a gradual decline in density. Giant Sequoias are having difficulty reproducing in their original habitat (and very rarely reproduce in cultivation) due to the seeds only being able to grow successfully in mineral soils in full sunlight, free from competing vegetation. Although the seeds can germinate in moist needle humus in the spring, these seedlings will die as the duff dries in the summer. They therefore require periodic wildfire to clear competing vegetation and soil humus before successful regeneration can occur. Without fire, shade-loving species will crowd out young sequoia seedlings, and sequoia seeds will not germinate. When full grown, these trees typically require large amounts of water and are therefore often concentrated near streams. In addition to fire, there are also two animal agents for Giant Sequoia seed release. The more significant of the two is a longhorn beetle (Phymatodes nitidus) that lays eggs on the cones, into which the larvae then bore holes. This cuts the vascular water supply to the cone scales, allowing the cones to dry and open for the seeds to fall. Cones damaged by the beetles during the summer will slowly open over the next several months. Some research indicates that many cones, particularly higher in the crowns, may need to be partially dried by beetle damage before fire can fully open them. The other agent is the Douglas Squirrel (Tamiasciurus douglasi) that gnaws on the fleshy green scales of younger cones. The squirrels are active year round, and some seeds are dislodged and dropped as the cone is eaten. Source: United States National Park Service—. Note that the volume figures have a low degree of accuracy, due to difficulties in measurement; stem diameter measurements are taken at a few set heights up the trunk, and assume that the trunk is circular in cross-section, and that taper between measurement points is even. The volume measurements also do not take cavities into account. The measurements are however trunk-only, and do not include the volume of wood in the branches or roots. The General Sherman tree is estimated to weigh about 2,100 tons (Fry & White 1938). Wood from mature Giant Sequoias is highly resistant to decay, but is fibrous and brittle, making it generally unsuitable for construction. From the 1880s through the 1920s, logging took place in many groves in spite of marginal commercial returns. Due to their weight and brittleness, trees would often shatter when they hit the ground, wasting much of the wood. Loggers attempted to cushion the impact by digging trenches and filling them with branches. Still, it is estimated that as little as 50 percent of the timber made it from groves to the mill. The wood was used mainly for shingles and fence posts, or even for matchsticks. Pictures of the once majestic trees broken and abandoned in formerly pristine groves, and the thought of the giants put to such modest use, spurred the public outcry that caused most of the groves to be preserved as protected land. The public can visit an example of 1880s clear-cutting at Big Stump Grove near Grant Grove. As late as the 1980s, some immature trees were logged in Sequoia National Forest, publicity of which helped lead to the creation of Giant Sequoia National Monument. The wood from immature trees is less brittle, with recent tests on young plantation-grown trees showing it similar to Coast Redwood wood in quality. This is resulting in some interest in cultivating Giant Sequoia as a very high-yielding timber crop tree, both in California and also in parts of western Europe, where it may grow more efficiently than Coast Redwoods. In the northwest United States some entrepreneurs have also begun growing Giant Sequoias for Christmas trees. Sequoiadendron giganteum at Westonbirt Arboretum, Gloucestershire, England. Giant Sequoia is a popular ornamental tree in many areas. It was first brought into cultivation in 1853 by Scotsman John D. Matthew, who collected a small quantity in the Calaveras Grove, arriving with it in Scotland in August 1853 (Mitchell 1996). A much larger shipment of seed collected (also in the Calaveras Grove) by William Lobb, acting for the Veitch Nursery, arrived in England in December 1853. Growth in Britain is very fast, with the tallest tree, at Benmore in southwest Scotland, reaching 54 meters (175 feet) at age 150 years (Tree Register of the British Isles), and several others from 50-53 meters tall; the stoutest is 3.55 meters (11.7 feet) in diameter, in Perthshire. Other areas where it is successfully grown include most of western and southern Europe, the Pacific Northwest of North America north to at least Vancouver, southeast Australia (the Ballarat Botanical Gardens contain a significant collection; many of them about 150 years old), New Zealand and central-southern Chile. Growth rates in some areas are remarkable; one young tree in Italy reached 22 meters (72 feet) tall and 88 cm (3 feet) trunk diameter in only 17 years. In the northeastern United States, there has been some limited success in growing the species, but growth is much slower there, and it is prone to Cercospora and Kabatina fungal diseases due to the humid summer climate there. The tallest reported in the east is one about 35 meters tall, at Blithewold Gardens, in Bristol, Rhode Island. Specimens also grow in the Arnold Arboretum in Boston, Massachusetts (planted 1972, 18 meters tall in 1998), in Lima, Pennsylvania, at the Longwood Gardens near Wilmington, Delaware, and in the Finger Lakes region of New York for many years. Private plantings of Giant Sequoias around the Middle Atlantic States are not uncommon. A cold-tolerant cultivar 'Hazel Smith' selected in about 1960 is proving more successful in that area. This clone was the sole survivor of several hundred seedlings grown at a nursery in New Jersey. The limit of winter cold tolerance is generally down to about −30° C (-22° F), but with a few individuals known to have tolerated lower temperatures, particularly where they benefit from deep snow cover over the roots. One in Poland has purportedly survived temperatures down to −37 °C with heavy snow cover, and, since 2000, a small experimental planting has been underway in the Lake Champlain valley of Vermont where winter temperatures can reach −37 °C with variable snow cover. The Dawn Redwood (Metasequoia glyptostroboides) is found in central China in the provinces of Sichuan and Hubei. Smaller than the other redwoods, it also differs in that it is deciduous (lose all of their foliage for part of the year) like the Bald Cypress (Taxodium distichum). The two redwood species mentioned above are evergreen trees. Older specimens of the Dawn Redwood form wide buttresses on the lower trunk. The leaves are opposite, 2-4 cm long, and bright fresh green, turning a foxy red-brown in fall. The cones are 2-3 cm in diameter with 16-30 scales. They are arranged in opposite pairs in four rows, each pair at right angles to the adjacent pair. 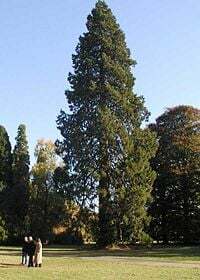 The Metasequoia genus was first described as a fossil from the Mesozoic Era, but in 1941 a small stand of an unidentified tree was discovered in China; due to World War II, these were not studied further until 1944 and only finally described as a new living species of Metasequoia in 1948. In 1948, the Arnold Arboretum of Harvard University sent an expedition to collect seeds and, soon after, seedling trees were distributed to various universities and arboreta worldwide for growth trials. In the late 1980s, it was discovered that many of the second-generation trees in cultivation suffered from inbreeding depression (extremely low genetic variability), which could lead to increased susceptibility to disease and reproductive failure. This was because most of the trees were grown from seeds and cuttings derived from as few as three trees that the Arnold Arboretum had used as its source. More widespread seed-collecting expeditions in China in the 1990s sought to resolve this problem and restore genetic diversity to cultivated Dawn Redwoods. The Dawn Redwood has proved an easy tree to grow in temperate regions, and is now widely planted as an ornamental tree. Planted specimens have already reached 25-40 meters (82-130 feet) in height and 1-1.3 meters (3.3-4.25 feet) in girth, despite being in cultivation for only 60 years. This rapid rate of growth has led to consideration for using the tree in forestry. Metasequoia fossils are known from many areas. During the Paleocene-Eocene Thermal Maximum, extensive forests of Metasequoia occurred as far north as Axel Heiberg Island (northern Canada) at around 80° N latitude. Large petrified trunks and stumps of the extinct Metasequoia occidentalis also make up the major portion of Tertiary fossil plant material in the badlands of western North Dakota in the United States. Aune, P. S. (ed.) 1994. Proceedings of the Symposium on Giant Sequoias. U.S. Dept. of Agriculture Forest Service (Pacific Southwest Research Station) General Technical Report PSW-GTR-151. Fry, W., and White, J. B. 1938. Big Trees. Stanford, CA: Stanford University Press. Jahren, A. H., and Sternberg, L. S. L. 2003. "Humidity Estimate for the Middle Eocene Arctic Rain Forest." Geology (May). Kilgore, B. 1970. "Restoring Fire to the Sequoias." National Parks and Conservation Magazine 44(277):16–22. Thomas, H. H.; Shellhammer, H. S.; and Stecker, R. E. 1980. Giant Sequoia Ecology. U.S. Department of the Interior, National Park Service, Scientific Monograph Series 12. Washington, D.C. This page was last modified on 7 July 2015, at 19:37.